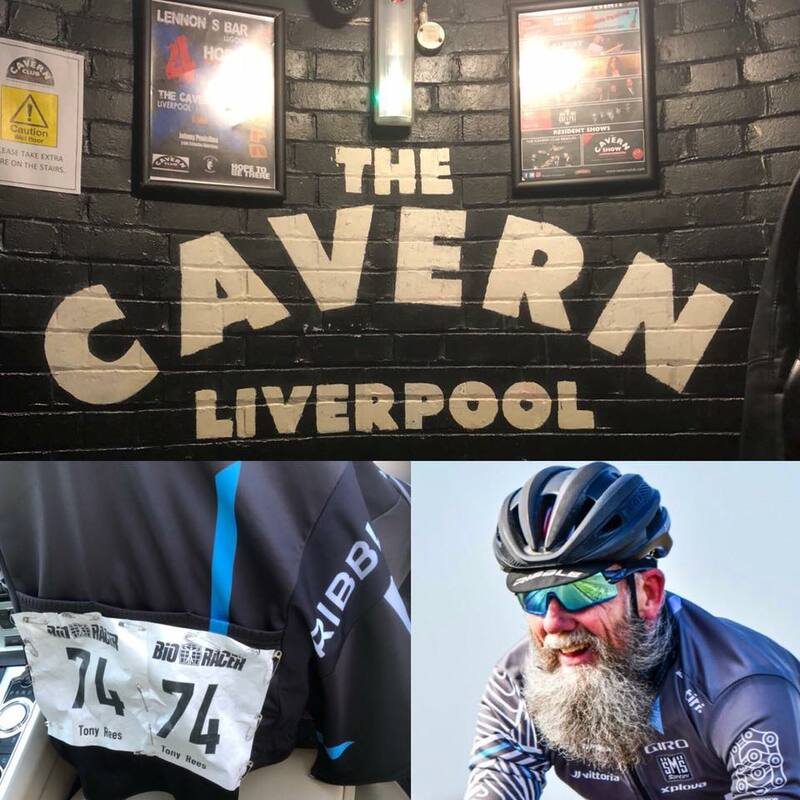 Learning a lesson: From the Cavern Club to the Pain Cave | theraceforthecafe.com . I haven't raced on Merseyside before but I have visited Liverpool a few times and enjoyed the city every time. When I mentioned to my wife Sue and daughter Ellie that I was racing nearby we decided to make a weekend of it so they could get in some Sunday morning retail therapy in Liverpool One while I was at the bike race - good plan. The only snag is whenever we are in the city it's become a bit of a tradition that we 'pop' in to the Cavern Club. So pop in we did, but I was absolutely adamant that I was only going to have one ... or possibly two beers, famous last words ! 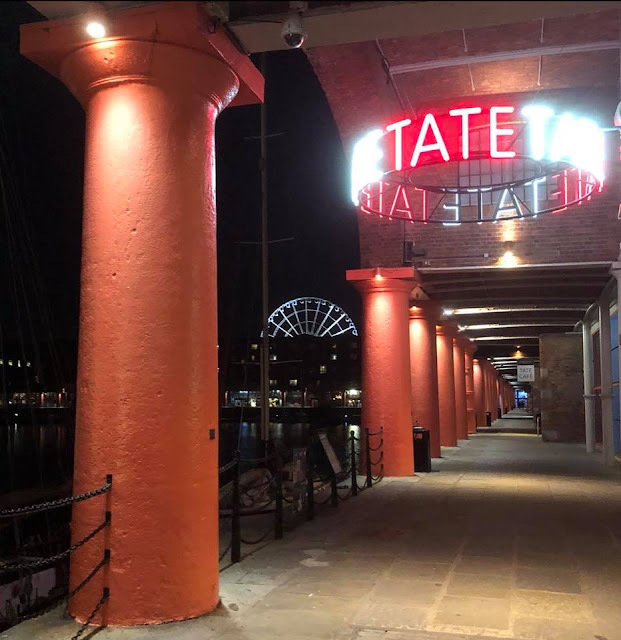 After a short stop-over back at our hotel we spent the evening down at Albert Dock. A really nice meal at the impressive Gusto restaurant and inevitably a couple more drinks and by the time we hit the fresh air to stroll back I had come to the inevitable conclusion that - yes, it was going to hurt in the morning for sure. This was a British Cycling event with two races on the same circuit, a 40+ Masters and my race the 50+ Masters. This was the only BC organised race that I am doing this year as I have previously posted that my season will be mainly focused on age group racing organised by the TLI and LVRC where I will be competing in the 'E' Category (60+) so even before my over indulgence in the Cavern I wasn't particularly optimistic about my chances in this race (just as well) especially as the start sheet included quite few BC 2nd Cat riders. The race was six laps for a total distance of approximately forty miles. The circuit was fairly flat but with no hedges or trees so it was very exposed. 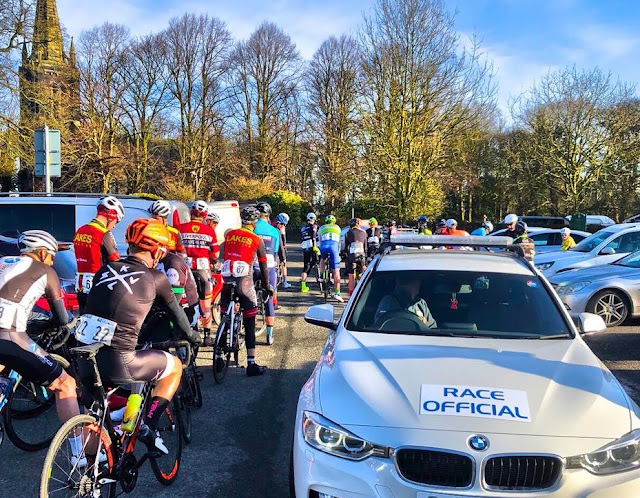 The first three laps were spent with the race mostly in one long line with some huge turns done by one particular rider, John Agnew from Lune CC although he was making the race hard he didn't manage to cause a split. During the early laps my heart rate was a few percent higher than I wanted it to be but I was managing to hold a reasonable position and not in any danger of being dropped - then the attacks started. 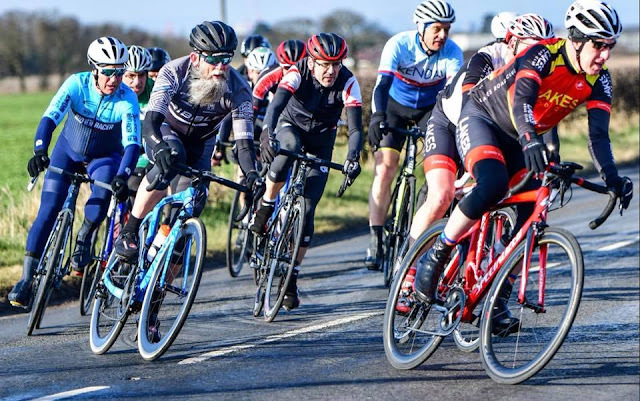 There was a bit of a lull on lap four and I moved up to about tenth to try and get maximum shelter and create a bit of 'sliding space' and it was at this point that I started to believe that I might actually survive and get round in the bunch. My confidence was misplaced though as a couple of minutes later a big attack went on the right hand side of the road and I was immediately grovelling to get on to a wheel - any wheel ! A little gap opened up which soon became a couple of bike lengths and that was it, the bunch was disappearing in to the distance. 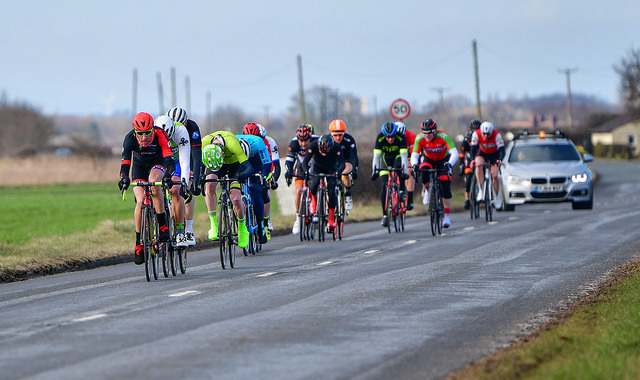 If you have ever been 'out the back' in a bike race you will know that it seems like just a few seconds after you have been dropped the bunch appear to slow down and for a brief moment you think you can regain contact - you can't and I didn't ! That was it, resigned to the last two laps solo, you can see my race data here Strava. No need to look for your's truly in this picture as I had already been off-loaded by this point, but you can see that a few people were hurting on the exposed sections of the circuit. Although it wasn't particularly windy it still had an effect when the strong men at the front decided to put the pressure on. 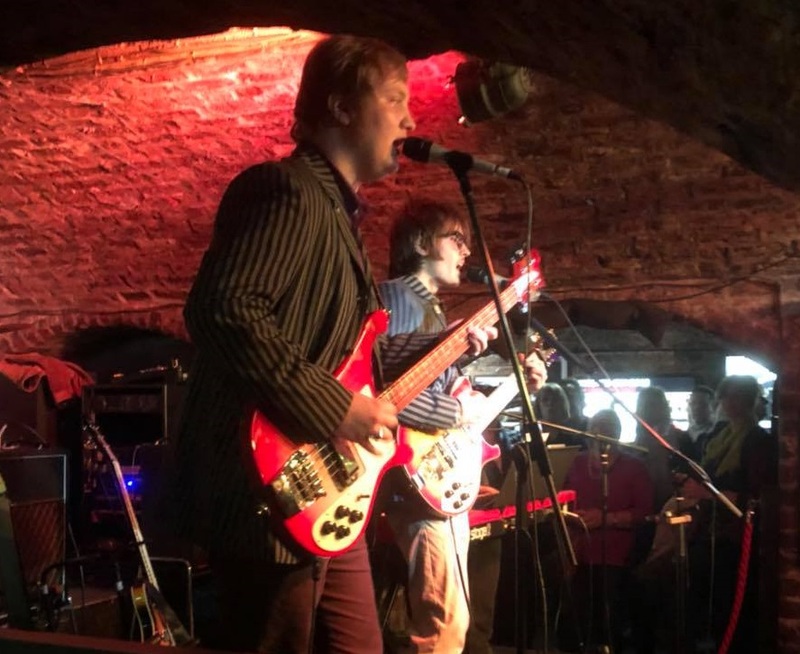 When I though about it later I didn't remember seeing any of these fellas in the Cavern Club the day before... funny that. The race was decided on a sprint from a small group of six who had escaped on the final lap. The winner was Andy Bennett of Omnipex Bio Race RT with Simon Deplich of Team Chronomaster/Leisure Lakes Bikes second and Karl Smith of Bott Cycle Team third. 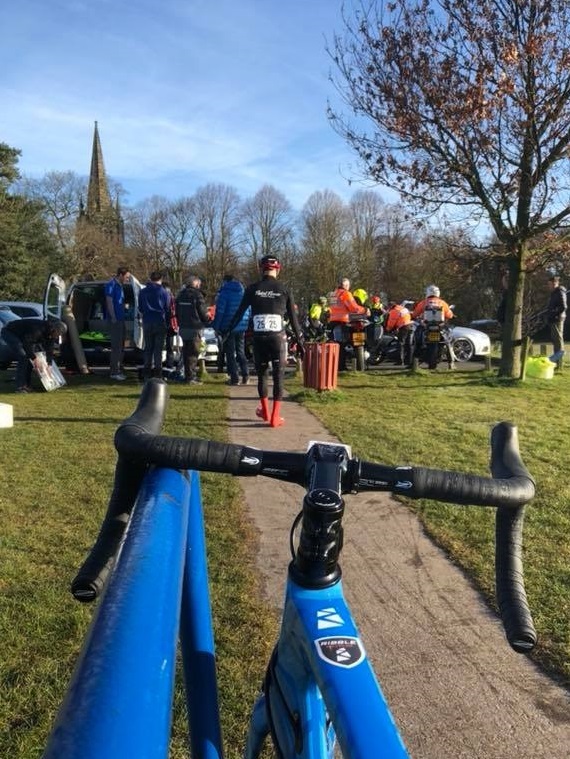 Above - Today (08/04) I raced in a TLI road race race at Bashal Eaves near Clitheroe in Lancashire which was round one of the eight race Lapierre Series. 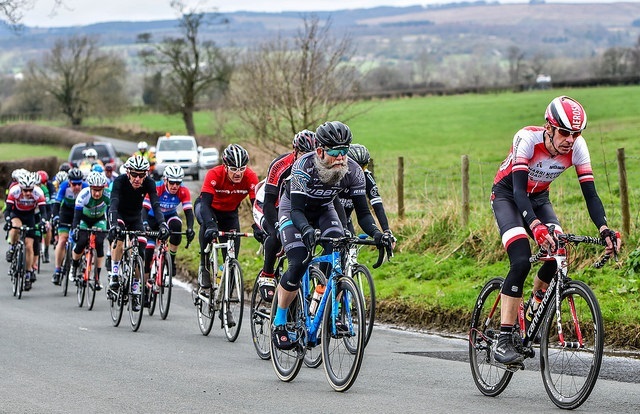 So I was racing in the Ribble Valley on my Ribble Aero 883 for Team Ribble. I arrived at the race fresh after a good week of preparation, clear headed and raring to go, managed to sneak in to the top ten and picked up some series points - I even did a few turns on the front !